This writing table was designed by one of the leading craftsmen of the 19th century, Henry Dasson (1825-1896). Dasson began his career as a bronze sculptor, and only later became an ébéniste (cabinetmaker). Because of this, Dasson’s furniture is often decorated with exceptionally-crafted bronze mounts. This writing table is a prime example, displaying finely-cast gilt bronze decoration. The table features a circular body, with a shaped front. It has a ‘bleu turquin’ marble top, enclosed within a pierced gilt bronze gallery. At one end of the tabletop, there is a covered letter rack, on which stands a gilt bronze three-light candelabrum. The front of the cabinet body features an open compartment, perfect for storing books or writing equipment. The sides and back of the body are decorated with trellis marquetry work. On one side, there is an open compartment, above of which is a pull-out, leather-topped writing desk. On the other side, there is a door which opens onto a white marble-lined cabinet interior. The table stands on four cabriole legs, mounted with gilt bronze foliate scrolls, which continue down the length of the legs and terminate in curled feet. The table is signed ‘Henry Dasson & Cie, 1891' in two places. A fine French kidney shaped bureau plat desk, having an inset beige leather top. Two side drawers over cabriole legs with ormolu mounts. 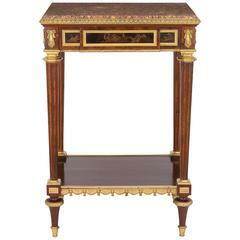 French 19th century Louis XV style marquetry inlaid side table writing desk. Stock number: F129.